Our striping trucks are uniformly outfitted with the same equipment, materials, support items and stencils to ensure uniformity at all of our customer’s properties. The handicap stencil or arrow stencil we use on your property in New Jersey will match your property we stripe in Virginia. Do you manage multiple properties in multiple states? 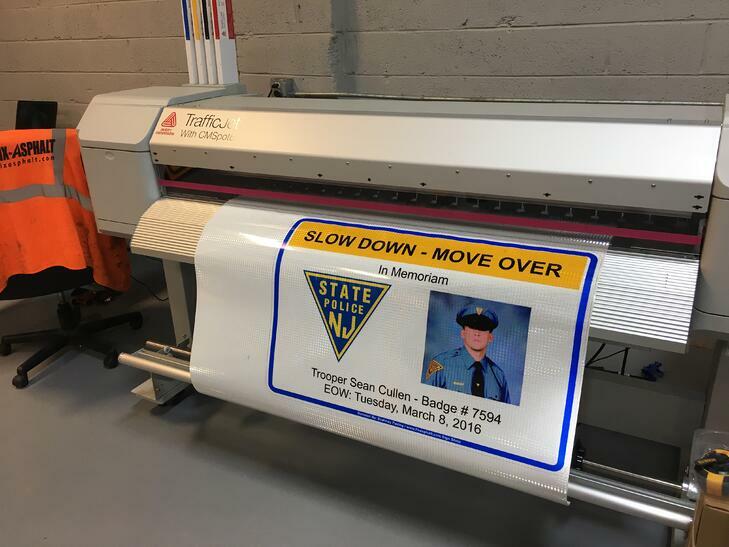 We can custom tailor a striping program for your specific needs from 10 – 750 sites. If you choose, we can arrange to have all the stencils match at all of your locations along with adding any type of custom logos or special “font” lettering if you choose. You will mostly be forced to deal with “part-time” stripers who only work on their days off from their regular jobs. This means, if you get a violation to cure with-in 72 hours for a worn out handicap stall on Monday and your striper can’t get there until Saturday which is his / her next day off, what are you going to do in this situation? There is little to no communication. The striper may just schedule the job when it is convenient to them and not notify anyone that they are showing up. You may find out they arrived the same night that your power washing contractor is due to power wash the sidewalks at 5:00 AM and the paint is still wet on the curbs and sidewalks. What are you going to do in this situation? 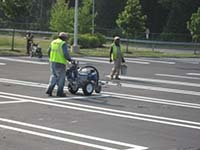 With the slim margins that are present in striping as it is, you may find your parking lot to have crooked lines, un-matching starts and stops at the ends of the parking stalls, paint flaking off of yellow curbs, stencils that are smaller than the ones that were there before but were never blocked out or Handicap Stalls which are not ADA Compliant. What are you going to do in this situation? The contractor does not understand the busy times of your business so they show up at a fast food restaurant at 12 PM on a Friday afternoon and have half of your parking lot blocked off! What are you going to do in this situation? 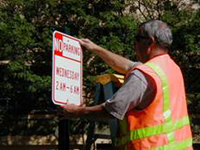 Federal Guidelines Which Impact Signs & Pavement Markings on PRIVATE PROPERTY to include: Shopping Centers, Office Parks, Residential Developments, Apartment Complexes, Entertainment Centers etc. 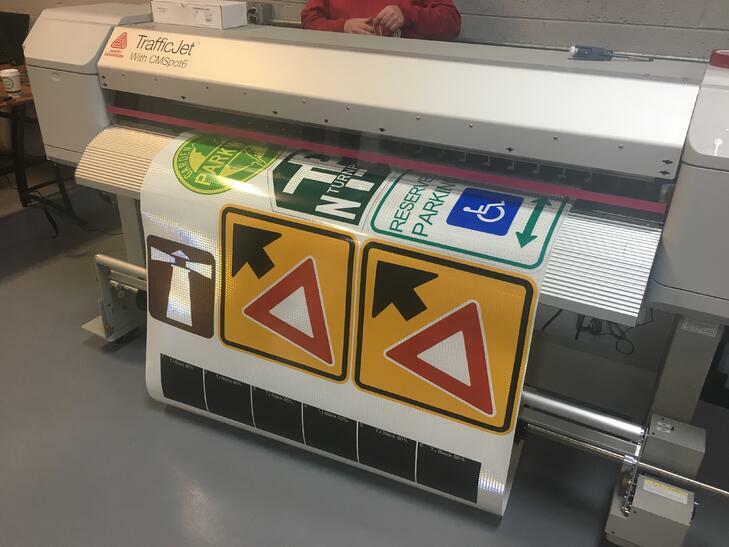 In March 2017 we opened an in-house sign shop to fabricate traffic signs. 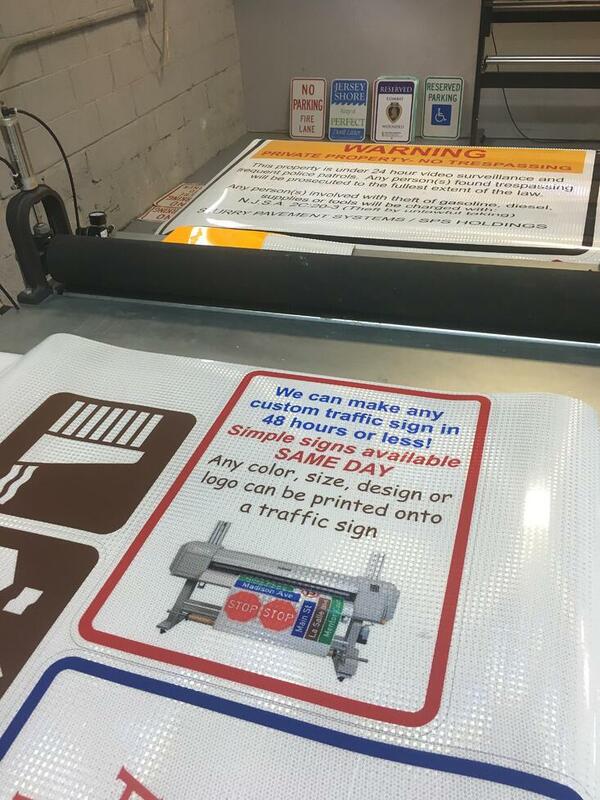 Our in-house sign shop is able to custom fabricate any traffic sign from a simple No Parking Sign to a custom traffic sign with any wording, logo, picture or design.